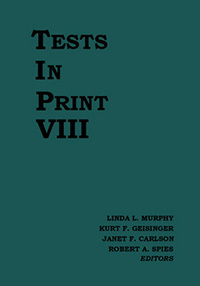 Tests in Print (TIP) serves as a comprehensive bibliography to commercially available tests that are currently in print in the English language. 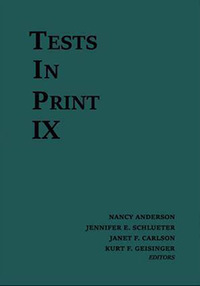 Now in its Ninth Edition, TIP provides vital information about tests to test users including test purpose, intended test population, administration times, scores generated, price, test publisher, in-print status, test acronym, publication date(s), and test author(s). A score index permits users to identify what is measured by each test. Tests in Print also guides readers to candid test reviews written by testing experts and published in the Mental Measurements Yearbook series. Tests in Print is an indispensable reference volume for professionals in education, psychology, business, and anyone interested in the critical issues of tests and testing. Find citation information here. Edited by Linda L. Murphy, Robert A. Spies, and Barbara S. Plake. 2006. Hardbound, ISBN 978-0-910674-59-1. Edited by Linda L. Murphy, Barbara S. Plake, James C. Impara, and Robert A. Spies. 2002. Hardbound, ISBN 978-0-910674-56-0. Edited by Linda L. Murphy, James C. Impara, and Barbara S. Plake. 1999. Hardbound, ISBN 978-0-910674-51-5. Edited by Linda L. Murphy, Jane Close Conoley, and James C. Impara, 1994. Hardbound, ISBN 978-0-910674-53-9. Edited by James V. Mitchell, Jr., 1983. Hardbound, ISBN 978-0-910674-52-2. Edited by Oscar K. Buros, 1974. Hardbound, ISBN 978-0-910674-14-0. Edited by Oscar K. Buros, 1961. Hardbound, ISBN 978-0-910674-08-9.